Ellen Maddow in The Room Sings. Photo by Suzanne Opton. BOTTOM LINE: Through the overlapping tales of a lakeside house and its residents, The Room Sings ponders the stories and impact we leave behind. The physical spaces we inhabit can hold countless stories: looking at an old building or family estate, we may wonder about the lives of those it housed, and consider how our tales fit into its larger narrative. The Talking Band explores this concept in The Room Sings, a winsomely expressionistic saga of a seventy-year-old lakeside house and the individuals who called it home. The show literally starts with the room singing, as the house itself (Ellen Maddow) welcomes us with nonsensical tunes about the termites in its walls and junk in its closets. These song interludes, like the setting, form the play’s throughline, lending atmosphere and narration as they connect the tales that ensue. 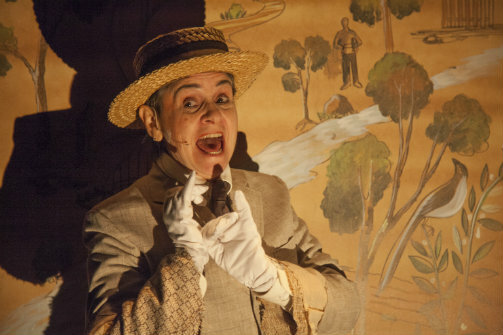 With her vaudevillian clownishness, threadbare beige suit, and dusty porkpie hat, the creaky-voiced Maddow aptly personifies the scruffy-but-venerable surroundings in which the play’s circumstances occur. Backtracking through time from the house’s 2015 owners to its original residents in 1943, we witness four generations of families as they define their relationships to the space, the world, and each other. Having inherited the house from her mother Gloria, current owner Hope (Abigail Ramsey) and her husband Sidney (Will Badgett) are eager to unload the property and fund their dream trip to Florence with its sale. As struggles with repairs and overzealous wildlife give way to revelations about Gloria’s past and concern for Hope’s ailing father William (James Himelsbach), Hope’s resentment of her legacy turns to deeper respect for the love and sacrifice on which it stands. During the summer of 1987, the house becomes a hunting lodge for brothers Al (Joe Roseto) and Sal (Andrew Weems) as the two seek refuge from city life and existential turmoil. Disbarred from his law practice due to mismanaged investments and personal scandal, Al throws his energy into composing a puppet opera, with the help of Sal’s stage-manager expertise. While the house’s wooded surroundings offer fresh inspiration, the arrival of Al’s wife Loretta (Theresa McCarthy) forces the brothers to face the larger consequences of Al’s mistakes. In 1958, Colombian teen Oskar (Luka Kain) and prickly Chinese landlord Mr. Ma (Henry Yuk) join forces to confront the house’s resident ghosts and the specters of their own grief. Bonding over legends of the original owner, an alcoholic sea captain (Jack Wetherall) murdered by his carping sister (Tina Shepard), the pair’s adapted ancestral rites help Oskar process his father’s untimely death and Ma make peace with his mother’s restless spirit. As the show fluidly jumps between these narratives, we see each story’s imprint on its successors, from subtle physical traces (Hope’s discovery of Oskar’s drawings on the old wallpaper; Al’s unearthing of Ma’s artificial “ghost money”) to creative source material (incorporation of the captain’s murder into Al’s opera) to direct impact (banshee-like apparitions confounding Oskar’s sleep). Themes of infinity and interconnection echo throughout, most commonly as third-person monologues in which characters contemplate their places in the house’s history and envision the futures it will contain. The play’s striking visuals enhance and highlight this sense of correlation. Supported on rolling platforms, Nic Ularu’s simple plywood sets unfold and coalesce like the tales themselves, shifting to form the house’s interiors, exteriors, and lakefront landscapes. Inspired by photographer Barbara Probst’s multi-angle, single-subject pictures, the pieces simultaneously encompass each story’s particular trappings and countless possible configurations. Baxter Engle’s nature-shot video backdrops, mixed with the chirps, clinks, and groans of Tim Schellenbaum’s soundscapes, give the same sense of fixed-but-active place. Likewise, Ralph Lee’s puppets, appearing as nightmarish ghosts or charming, operatic beavers, lend fitting touches of surrealism. As mortal beings in a transient, ever-shifting world, our efforts to find a physical or psychic home can be fraught with confusion, angst, or absurdity. The Room Sings acknowledges this truth with Zen-like clarity but embraces it with childlike joy, celebrating the places we love and the meanings we give them. Our lives, like our surroundings, can reveal boundless wisdom, if we sit quietly and let them sing. The Room Sings is written and directed by Paul Zimet. Composed by Ellen Maddow. Set Design by Nic Ularu. Lighting Design by Lenore Doxsee. Costume Design by Kiki Smith. Puppet Design by Ralph Lee. Video Design by Baxter Eagle. Assistant Director is Kristin Kelly. Production Stage Manager is Lisa McGinn. Presented by La MaMa in association with The Talking Band. The cast is Will Badgett, James Himelsbach, Luka Kain, Ellen Maddow, Theresa McCarthy, Abigail Ramsay, Joe Roseto, Tina Shepard, Andrew Weems, Jack Wetherall, and Henry Yuk.